This class introduces quilting feathers with a domestic machine. The skills learned can also be used on sit down quilting machines such as the Baby Lock Tiara. Make sample blocks with feather samples using free motion, stencils, and/or rulers. 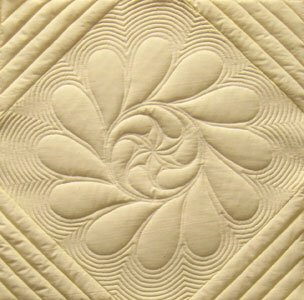 Combine techniques they have learned to create beautiful and interesting quilting designs. Make FOUR 14" x 14" quilt sandwiches to use for blocks that wil lbe joined to make a table runner, bed scarf, or wall hanging. (Bring them to class ready to use.) Choose fabric that will coordinate with your decor. Bring sashing, borders, and backing fabric for your decor project. Select rulers, templates/stencils that you would like to use. Bring a pounce pad with iron-off chalk.